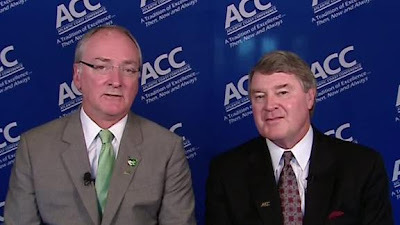 ACC commissioner John Swofford and Notre Dame athletic director Jack Swarbrick addressed the media Wednesday and answered several questions about the Irish joining the league in all sports but football. Notre Dame plans on implementing its ACC foootball scheduling partnership in 2014, with five games against ACC schools per season. The current plan is to have Notre Dame play every ACC school at least once in a three-year period. The Irish already have future scheduling arrangements with Boston College, Pittsburgh, Miami, Wake Forest and Syracuse. This new partnership also means Notre Dame joins the ACC bowl lineup. Notre Dame would be an option as an opponent in the Orange Bowl. Beyond that, Notre Dame would be a potential team to play in any of the ACC contracted bowls. Its overall record would have to be better than, equal to or within one win of ACC teams available to be selected. Notre Dame would share in the revenues if selected to any of those bowls, and get an expenses allowance. If Notre Dame is picked for a BCS game, it would keep its revenues from that appearance. This bowl partnership would begin for the 2014 season. Swofford said league athletic directors may revisit the decision to play a nine-game league schedule with the Notre Dame scheduling agreement. Teams like Clemson, Georgia Tech and Florida State would have to play their in-state rival game and Notre Dame at least once in a three-year span during nonconference. On the same note, Swofford said adding Notre Dame helps boost strength of schedule, an important factor that will be considered when teams are selected for the future playoff. Swarbrick would say only that Notre Dame plans to honor its commitment to the Big East. That would require a 27-month waiting period and entry in 2015-16. But recent departing schools have left earlier. 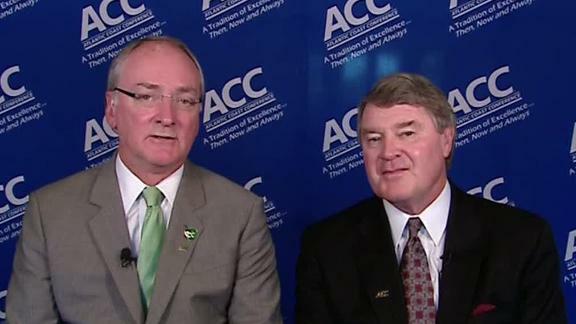 And, the new $50 million ACC exit fee goes into effect immediately.